"Cinthia Brumfeild was born in the state of Georgia on Dec. 12, 1804 and moved to Pike County, Miss. At the age of 8 years and remained there until death. She married Davis Brumfield in 1824 and reared a large family. He died in 1864. She united with the Union Church in June 1850 and remained a faithful member of that church until her death. She died July 10, 1884. She leaves 7 children, 1 brother, 2 sisters, and many grand-children and great grand-children." From: Williams, E. Russ. Abstracts of Obituaries from the Minutes of the Magee's Creek Baptist Association (Mississippi and Louisiana), 1882 - 1924. Monroe, Louisiana: Privately printed, 1978, page 6. From the Louisiana Archives, Baton Rouge, LA. These delicate handkerchiefs were sent to my maternal grandmother, Helen F Coyle, in November 1918 by Private Herman L. Englander: HQrs Co. 358th Infantry: Amr. Exp. Forces, France. He wrote to my grandmother from France, asking to see her once he returned to New York City. I do not know if they did see each other but he was not the man she did marry in 1921. However, she did save these precious items all her life. They are now so fragile that you can almost see through the fabric. 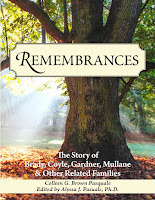 52 Ancestors in 52 Weeks = Week #34; Mary Isabella Heffelfinger; She ‘died’ Twice! Mary Isabella Heffeflinger was the daughter of Philip Heffelfinger & Elizabeth Mowrey. 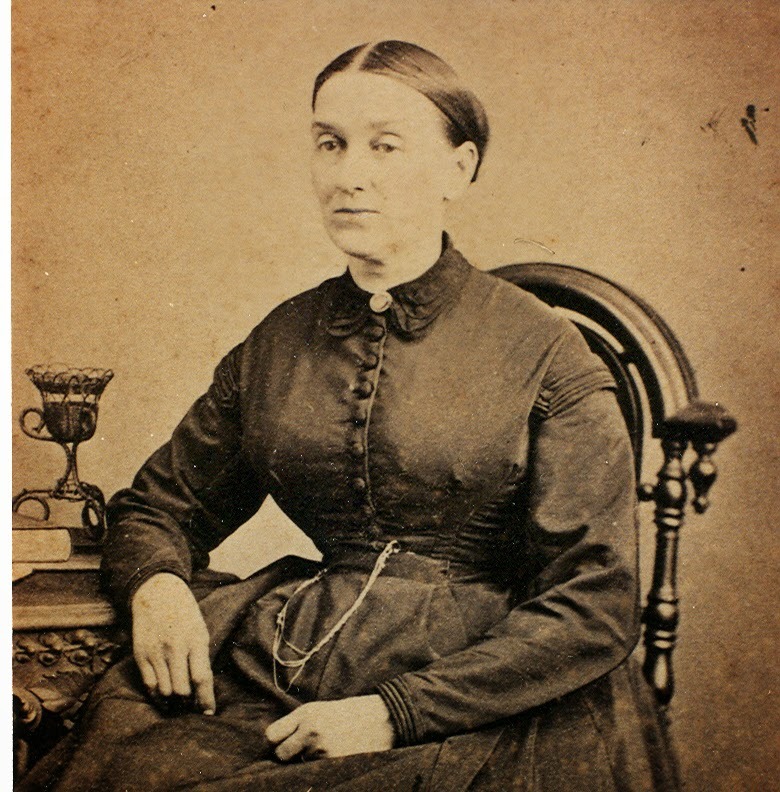 She was born in Cumberland Co., Pennsylvania, ,  but lived in Ohio when she married Abraham Mark on 21 February 1839. Mary Isabella was, according to the family, “a school teacher and well educated.” The 1840 census supports this, showing one person involved in a learned profession. Mary and her husband lived in Wayne Co., OH and raised eight sons there. The 1860 census shows seven of their eight sons: Thomas, John, William, Marion, Abraham Martin, Franklin & David. Youngest son, Edwin, was not born until the following year. Four sons served in the Civil War: Thomas Jefferson Mark, John Mark, William Mark & Marion Mark. Two did not return. John Mark died in December 1862 and Thomas Jefferson Mark died a month later, in January 1863. In 1870 Abraham and Mary Isabella had three sons still living at home and attending school: Franklin, David & Edwin. Their real estate was valued at $1,600 & personal estate at $500. In 1872 her husband died. He had been disabled for some time before his death. Mary Isabella applied to the government for a pension. 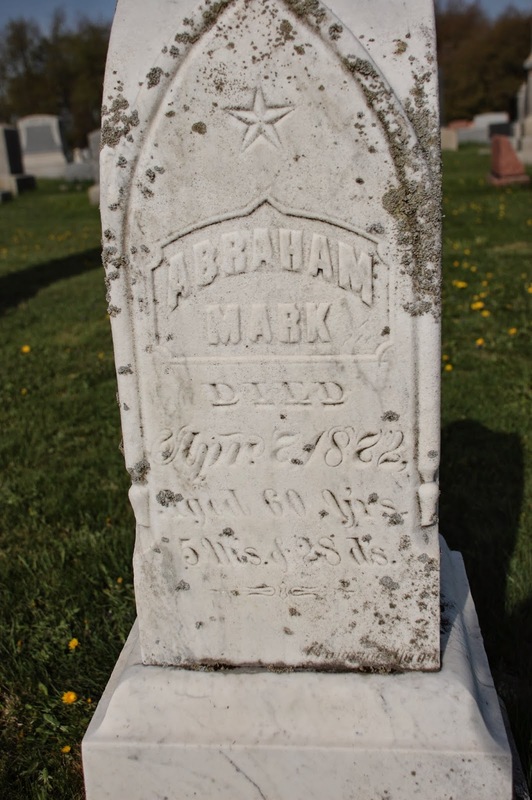 In her statement she said she was the widow of Abraham Mark who died 7 April 1872 and the mother of John and Thomas Jefferson Mark who died as soldiers in the Civil War. Because her husband had been disabled and unable to support his family she was dependent on support from her two sons. She had not remarried since the death of her late husband. Several neighbors and doctors testified to fact that Abraham was disabled and unable to support the family and that sons John and Thomas sent money home. Mary Isabella was eventually paid $12 a month. In 1880 she lived next door to her son Abraham Martin Mark and his family. In 1900 she was living with Abraham & family. My paternal grandmother told me the story of Mary Isabella’s ‘almost’ death. Mary Isabella was ill and fell into a coma. Her family thought she had died. They made arrangements for her burial. “She could understand and knew everything they said but she couldn't move a muscle.” The doctor came, saw sweat glistening on her forehead and told the shocked family that she was still alive. According to my grandmother Mary came out of the coma and lived another ten years. "I give, devise, and bequeath to my son Abraham M. Mark all my real estate consisting of a House and Lot in the Village of Reedsburg, O. and known as Lot No. 10 and all the Household goods, Furniture, Provisions and chattels being therein and in my possession at the time of my death. Second, my will is that all my just debts and funeral expenses shall be paid out of all Notes or Bonds, Moneys, or any Army credits which I may have to my credit at the time of my death. After the above just debts and funeral expenses are paid out of my credits the money remaining shall be divided in equal shares among my children except my son Abraham M. Mark who shall not receive any share of the said remaining credits." Information at the Wooster Public Library in Ohio tells us that Mary Isabella Mark is buried at Reedsburg Cemetery. I visited the cemetery and found her husband’s tombstone but I did not find one for her. Diary of Ivy Mark Brown gives birthdate of "Isabell Heffelfinger" as April 29, 1819. Genealogy of William Mark Family; 1844-1965; Compiled by Bertha Flickinger Mark. Ohio Marriage Record; 1839; Wayne County Probate Court, Ohio, Volume 4A; Page 253. Abraham Mark & Mary Isabella Heggelfinger. 1840 U.S. Census, Wayne County, Ohio; 1840; Vol.26; Page 8; Family History Center Microfilm #358211; NOTES: Abraham Marks family in Wooster Township. 1860 U. S. Census, Wayne County, Ohio; 1860; ; Page 150, Lines 14-22; Family History Center Microfilm #805051; NOTES: Abraham Marks Family in Congress Twp. Pension Report of John Marks; 1861-1883; National Archives Civil War Pension Report, Ohio Volunteers, Co.C. 16th Regiment, filed by mother, Isabelle Marks, Box #35175, Bundle #7. 1870 Federal Census, Wayne County, Ohio; 1870; Volume 60 (1-244); Page 19, Line 1 ; Family History Center Microfilm #552779; Notes: A. Mark Family in Congress Township. 1880 U. S. Census, Wayne County, Ohio; 1880; Compiled by Richard G. Smith, 1979, Published by Wayne Co. Historical Society Genealogical Section, Wooster, Ohio; Page 179; The State Library of Ohio, Columbus, Ohio. Isabell Mark in Plain twp. 1900 US Census. Ohio, Wayne, Plain township, Roll T623 1332, SD 16, ED 156, Sheet 5B, Lines 79 - 80. 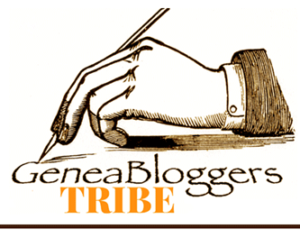 Interview with Ivy Regina Mark Brown; by author; 22 August 1994, Germantown, NY. Wayne County Probate Record 11014 Vol. ; copy from the Wayne County Public Library; Last Will & Testament of Isabella Marks, Reedsburg, Wayne, Ohio. April 7, 1899. My maternal grandmother, Helen Coyle, received a letter from a World War I soldier at the close of the war. The letter is dated ‘Somewhere in France, Nov. 15, 1918’, 96 years ago. I take pleasure in writing to you and to let you know that I have not forgotten you. I do hope you are well and enjoying yourself. I suppose everyone in New York is celebrating the great victory. It sure was great news when we heard of the news and the big guns ceased firing. I am feeling as fine as silk and am pretty happy now. We are still at the front but are expected to get released soon. Our division is about the first to start for home being that we were at the front at the time. I have a Hun helmet which you have so often asked for and I will explain it to you when I get back to the states. Please do not let my sister know that I am coming home. Would like to know where I could communicate with you when I arrive in N.Y. I hope in my last letter I have written to you on Oct 31, if there was anything I really did say anything that hurt your feelings which I might have said something which I do not recollect. I would like to send you my sincerest apologies. Now dear Helen let me know if I really have as I do not want to hurt your feeling for anything in the world. The weather over here is great for the last three or four days only that it is pretty cold over here. We are stopping at a town that was a German concentration camp once. They sure did leave an awful amount of refuge which we had to police up. They also left several barrels of sauerkraut and onions pickled also plenty of spuds. We have sauerkraut and spuds every day now. We now do drilling every day until we start back for the rear. I have written to you several times but I think my letters must of got lost on their way over. Let me know dear Helen if you have sent me those magazines and your picture? I hope you will enjoy your Thanksgiving dinner in peace. Will put my letter to a close now as I have nothing more to say that would be of interest to you at present and hoping to hear from you soon. I close and with my best and sincere wishes to you for good luck, health and happiness and may all three wishes be with you throughout your entire life. With my love and kisses to you. I remain as ever and may this letter reach you safe and find you in the best of health. I am as ever yours in remembrances forever. Herman also sent lace handkerchiefs to Helen. I have photographed them & will post the photos on Thursday, August 28. There is no further information on the relationship between Helen and Herman. There is no way to know what kind of misunderstanding occurred between them or if Helen ever saw him after his return from the war. Although they did not marry my grandmother did carefully save his letter. If anyone has a connection to Herman it would be great to hear from you. My paternal grandmother and her siblings,  all pointed to Abraham Mark as their paternal grandfather. They knew dates & places. However, no one knew his parents. I have strong sources leading me to Abraham but the Mark line stops there. Abraham Mark married Mary Isabella Heffeflinger. Both were born in Pennsylvania but were living in Wayne Co., Ohio when they were married on 21 February 1839.,  My grand uncle Clarence Mark claimed Abraham had a log cabin where the Wooster Court House now stands. Abraham and Mary Isabella remained in Wayne Co., OH for the rest of their lives, raising eight sons. They can be found there in a long list of census reports as their family grows. In 1860 Abraham is shown as a ‘master carpenter’. Four of their sons served in the Civil War: Thomas Jefferson Mark, John Mark, William Mark & Marion Mark. Two did not return. John Mark died in December 1862 and Thomas Jefferson Mark died a month later, in January 1863. W. C. Moore, MD was the family’s physician for many years. He treated Abraham frequently for spinal trouble, trouble with his Kidneys, and rheumatism. His "frequent ailments were so severe as to finally disable him entirely." Abraham died 7 April 1872 from ‘lung fever’. He is buried in Reedsburg Cemetery. Diary of Ivy Mark Brown, copy in possession of author. Interview with Clarence Mark; July 1993, in Greenville, Ohio; Information on the Abraham Mark family. Mark, Bertha Flickinger. Genealogy of William Mark Family, 1844 – 1965, privately printed. Marriage Record for Abraham Mark and Mary Isabella Heffelfinger, 21 February 1839, Volume 4A, Page 253, Wayne County Marriage Records, Wayne County Public Library, Wooster, Ohio. From Wayne County Public Library. 1860 U. S. Census, Wayne County, Ohio; 1860; ; Page 150, Lines 14-22; Family History Center Microfilm #805051; NOTES: Abraham Marks Family in Congress Twp., Taken 17 Aug 1860. Abraham "Marks". Death Record for Abraham Marks, 7 April 1872, Volume 1, page 38, Wayne County Probate Court, Court House, 107 W Liberty St., Wooster, Ohio. Genealogical Section of the Wayne County Historical Society. Wayne County, Ohio Burial Records. Ohio: Privately printed, Page 562; Plain Township, Reedsburg Cemetery. MARK: Abraham d. 4 - 7 - 1872, age 60 y 5 m 28 d.
"Seletia E. Smith, wife of W. L. Smith, was born June 9th, 1850, united with the Baptist Church April, 1867, died January 16th, 1902. She leaves a husband, six children, four brothers, four sisters … She was a member of Centerville Baptist Church at the time of her death. Her funeral service was conducted by Eld. W. J. Fortinberry." From: Williams, E. Russ. Abstracts of Obituaries from the Minutes of the Magee's Creek Baptist Association (Mississippi and Louisiana), 1882 - 1924. Monroe, Louisiana: Privately printed, 1978, page 57. From the Louisiana Archives, Baton Rouge, LA. 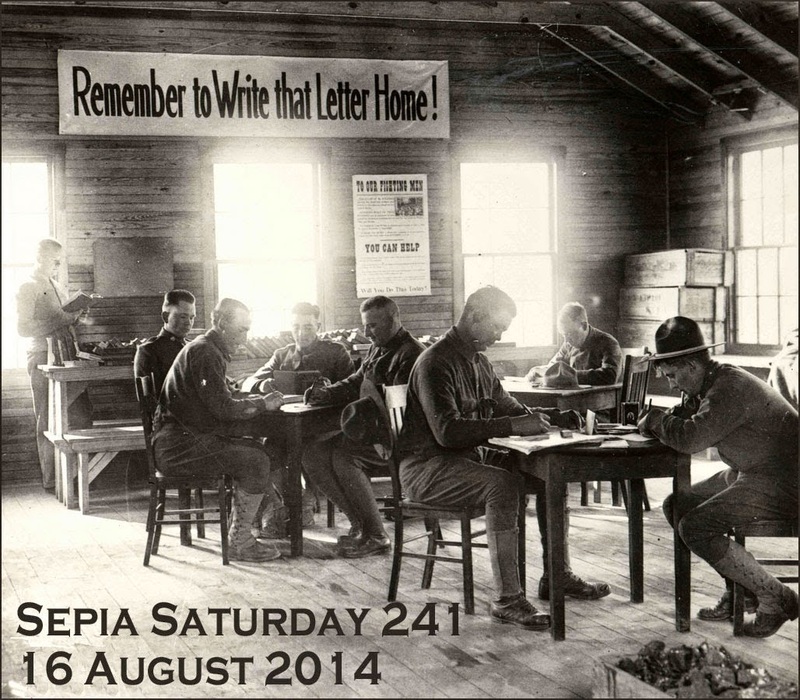 This week's topic at Sepia Saturday is Letters Home. The photos shows soldiers diligently writing home. I just had to add to the collection not because I have a photo of a soldier to share but because I have a World War I letter written by a soldier. This letter was not written to Mother & Father. It was written to a sweetheart. Private Herman L. Englander: HQrs Co. 358th Infantry: Amr. Exp. Forces, France. It was written to my maternal grandmother, Helen F. Coyle. I'd love to hear from someone related to the soldier. I will share the full text of the letter in a future blog post. 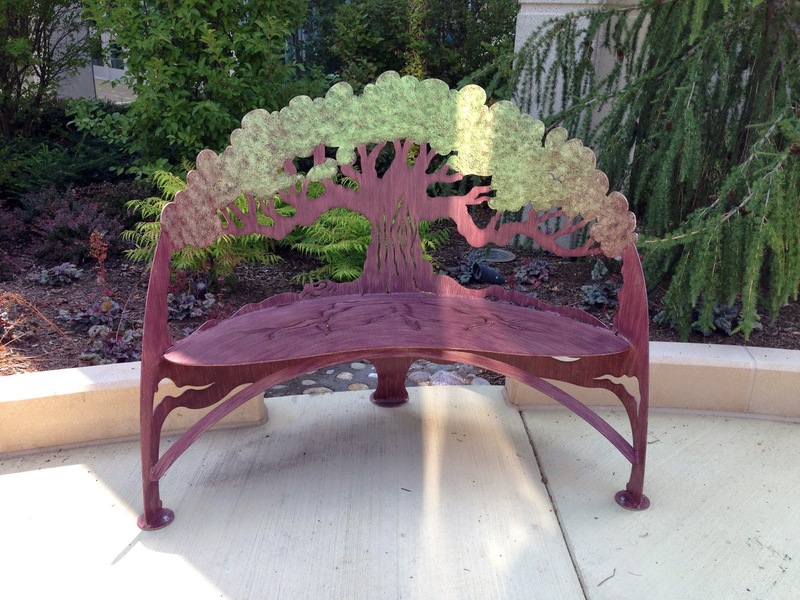 I found the perfect garden bench for the genealogist! 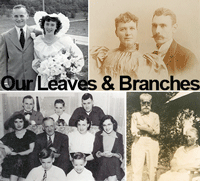 Sit & relax with a book of family history or gather the family around the bench for photos. Recently my daughter & I went to the College of Dupage, Illinois to see an exhibit at the Cleve Carney Art Gallery. We saw this bench in the garden and I had to snap a photo to share with other genealogists. Martha was the daughter of Jeremiah Smith & Joanna Dillon. Her siblings were: Hollander, Eli, Jane, Edwin, Wyatt, Eliza, Calvin, Lidda, Mehala, Milevey, Joanna & Jeremiah. Her brother, Wyatt Smith is also my 3x great grandparent. Therefore Martha & Wyatt’s parents are my Double 4x great grandparents! Martha married Edwin Barksdale Alford, son of Jacob Alford & Elizabeth Bryant, on 20 December 1818 in Pike, MS., In 1820 they were in Pike, MS with a young son. They would stay in the area and become the parents of 13 children. Grandmother was a well-chosen wife for him. Married at the age of sixteen years, she was mother before she was eighteen, had twelve children, all of whom lived to be grown except one that died in infancy. Two of Martha’s brothers lived near Martha & Edwin. Wyatt Smith & Calvin Smith also lived in in the Simmonsville & Progress area. The 1850 Census report shows Edwin as a 58 year old farmer. Martha still had 5 children at home. Sons, Jeptha and Seaborn were farm hands. Martha & Edwin are buried in the Edwin B. Alford Cemetery. The small cemetery is on a gravel road, one and one-half miles southwest of Silver Springs Baptist Church and 3/4 mile north of the Louisiana line. 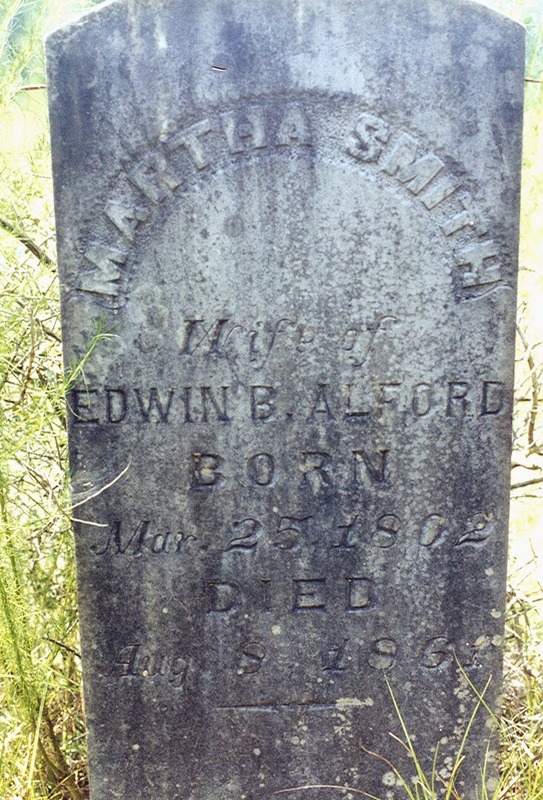 "Martha Smith Wife of Edwin B. Alford BORN Mar. 25, 1802 DIED Aug. 8, 1861". It is directly by the roadside on a small hill. Visiting the cemetery in August 1997, it was difficult to see the gravestones from just a short distance away because of the weeds and brush grown up all around and through the site. Holbrook and Fressenden’s Stereotype Edition of the Holy Bible, Brattleboro, VT, 1825. Original owner: Jeremiah Smith Sr. of Pike Co., MS. Copied by Texana Carter, 27 August 1854. In possession of Mrs. W C Uhlman, Rte 6, Tylertown, MS, great granddaughter. Copy given to author by Pat (Brock) Smith. Pedigree Chart for Roy Brown; 1700's to 1948; Compiled by Zelda Marie Alford Fortenberry; Given to author, June 1994, by Rayleen Brown Hall. Heard, Ruby Alford, Gil Alford. "Early Mississippi Alfords." AAFA Action: The Official Publication of the Alford American Family Association III (1990):p. 36. Tynes, Walter Edwin. My Pilgrimage, 1928. Land & Maps. Boyd, Gregory A. Family Maps of Pike County, Mississippi. Deluxe. Norman, Oklahoma: Arphax Publishing Co., 2005. 1850 U. S. Census, Pike County, Mississippi. Parish, Ray and June Sartin. Cemetery Inscriptions, Pike County, Mississippi 1750 - 1978. Privately published.